Cabinetry is more than just a pretty face. It makes mornings a happy time instead of a race against the clock, keeping important items close at hand and easy to locate. Grocery lists are easily compiled because your needs are all within a quick glance and effortlessly put away when brought home. It takes the dilemma out of “What’s for dinner?” and makes you the hero because everything is within reach and quick to put together. Fieldstone Cabinetry has the perfect solution to all of your organization questions. 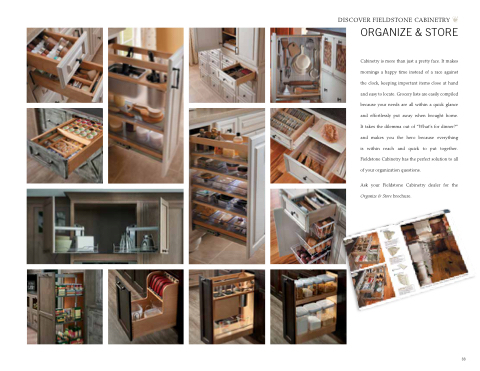 Ask your Fieldstone Cabinetry dealer for the Organize & Store brochure.